I don't post a lot here, more just look lots of cool bikes and learn a lot from everybody. But I am unfortunately writing because my bike was stolen out of my brother's condo building. There was some work being done in the building and it appears the workers left the door open. He's filing the police report and contacting the workers boss and insurance. I thought I'd post here as well; I have seen how helpful you all are. I know my photos are not great, but if you see anything like it, please let me know. It has campy drop outs, very thin, fine lugs, 650b Aleska rims, gran bois tires, a suntour cyclone derailleur, no front derailleur, nitto stem, nitto sweep back bars. For all the Twin Cities C&Vers at the Fall ride, this was the bike I was riding. Thanks so much for keeping an eye out. 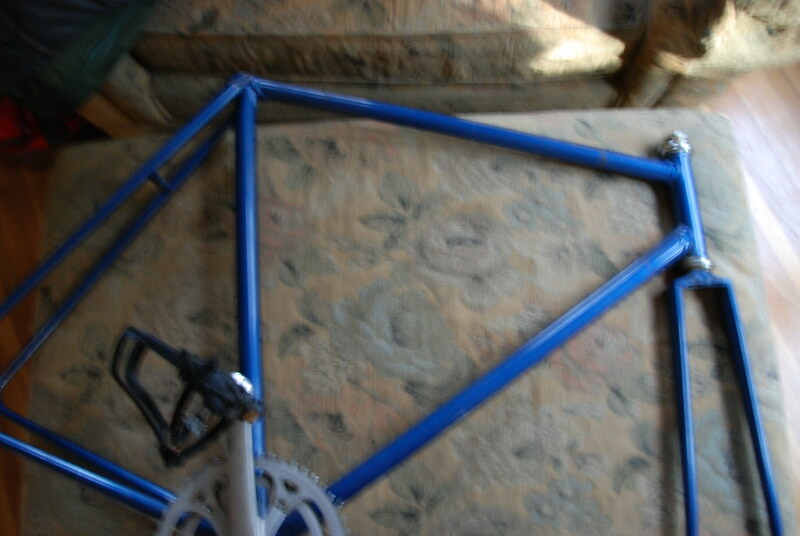 Yes, this was the frameset. Sorry for the blurry photo. I'll watch like a hawk for this bike. Start watching CL and checking in with local consign shops and used bike retailers. I'll send this link to some buds that work at local shops. It would give me great pleasure to find the thief. I'll keep an eye out for it on CL. Post it on the Twincities Bicycle Trading Post Facebook group also. That would add a lot of eyes on the lookout for it. Best wishes in getting it back!